Celebrating 50 Years Serving Oklahoma City! In 1967, Don Chaffin, President of Jackie Cooper Tire and Electronics began his enduring relationship with Jack Cooper. One year later, the first Jackie Cooper Tire retail store opened in Midwest City, Oklahoma. This set the course for many great ventures to come. Over the next four decades, Don’s leadership and vision lead the way to the success of 3 retail tire and service centers, 3 electronics stores and 9 AT&T stores throughout the greater Oklahoma City metro area and surrounding cities. 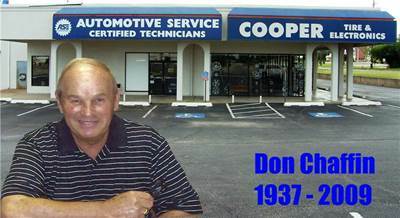 Throughout the next 42 years, with the direction and devotion of Don Chaffin, Jackie Cooper Tire and Electronics expanded from tires, wheels and automotive service to the latest technology in mobile electronics including cell phones, pagers, car stereos and car alarms. Thanks to the guidance, influence and dedication of Don Chaffin, Jackie Cooper Tint & Electronics is a recognized leader today in the mobile electronics industry, specializing in not only car audio and car security but car video, back up cameras, marine audio, remote start, radar detectors, car paint protection and automotive, residential and commercial window film. Don Chaffin created a lasting legacy in the company which is now run by his children, Donnie Chaffin and Jill Chaffin Splitt. Don left his mark not only in the company but also with everyone he came in contact with. We miss him daily and continue to strive to serve each other and our customers as he taught!